I’ve been busily preparing for my next event. Tomorrow I will be at the 2nd annual Chilo Chili Cook Off at the Chilo Locks and Dam. The event runs 11:30-3:30 and proceeds benefit the Clermont County Park District. The weather should be beautiful and the park there at the dam is nice in its own right. There will of course be chili to try but also lots of other vendors, like me, to peruse. Tickets are $8 at the door. As the New Richmond Farmer’s Market finished up for the season, the owner of the antique store that hosted it asked me to set up a booth in her store of my goods. This was an exciting new venture for me, but also required a fair amount of stock. I found myself looking towards this cookoff and two other events I have in November and December pretty low on stock. Luckily, I prepared for such a possibility way back in the spring when the flowers were in full bloom. As I picked, I made the infusions for jelly and froze some of them. Now, all I have to do is defrost them and go through the process of making the jellies. This is a wonderful trick to remember. 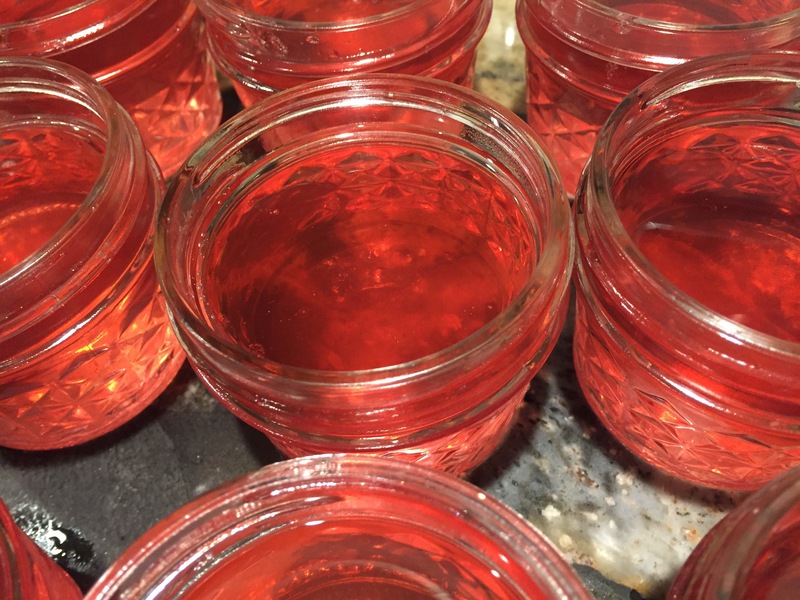 I know in the spring I sometimes feel like I have to pick, pick, pick to get as many of the flowers as possible when they’re in season but then I have so much jelly to make! Freezing the infusions allows you to focus on picking and save the jelly making for a quieter season. My neighbor Rita tells me the infusions can generally freeze for a about a year and still be fine for jelly. So this week the smell of spring has returned to my kitchen as I have made Lilac, Honeysuckle, Queen Anne’s Lace, Lavender Infused Dandelion, Dandelion, and Red Bud jellies. I also brought back a bushel of Michigan apples, fresh from the orchard. 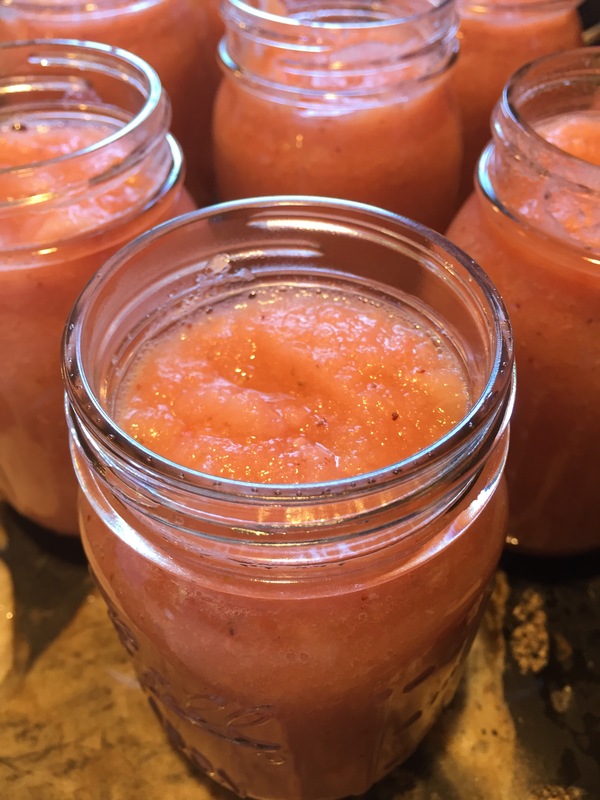 These made apple blueberry jam, applesauce and strawberry applesauce. 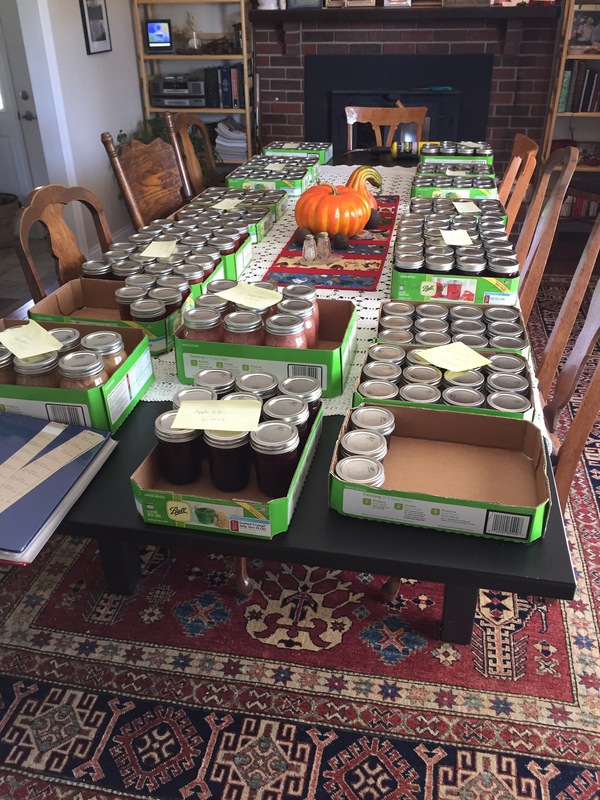 My dining room table is covered with jars waiting to be labeled. I’ll work on that this afternoon as I shuffle bread into and out of the oven. Come see me tomorrow for something good to eat for yourself or as a gift. Everyone love a present they can eat! That jelly looks so good! You have been super-busy! Can’t wait to visit your booth tomorrow.